Have you ever been lost before? You search and search, looking for something familiar. You seek a sign to give you direction. And then you find a marker. Something points you in the direction you need to go. You follow the trail, and you know where you are headed again. Heroes provide those markers. Such men and women give a model to live after. You see their footsteps and know what direction to take. My life is no exception. Much of what I understand and know is from those that walk before me. Their example inspires and encourages. And of those heroes, my father is chief among them. My father and I are having dinner in downtown Chicago. While enjoying our pizza, he gives me a gift. It is a plaque with the words: Real men are not born; they are made. Those words speak to what it means to be a hero. For heroes are who they are deliberately. In the discipline of developing character and in the challenge of living out that character, they make a conscious and purposeful effort. Nearly every day my dad gets up early. He spends time studying the Scriptures. They are an important part of his life. But he does not just say that they are important. He does it. He lives out what he says. Practice is not a onetime event. Though the tide will wash away your footprints, you must put in the effort every day. 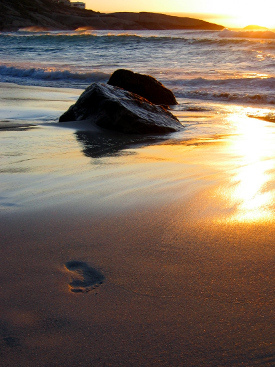 And after long, people will know you were there, not because of the footprints, but because they saw your habit. Heroes are not made on their own. They rely on the wisdom of the elder. They seek out the knowledge of those that go before. And then they listen. To walk in the footsteps of someone great, is to become like them. You model after them, and the modeling soon changes from an act to an existence. What was once only imitation is now part of your character. What is it that you want to live out? Practice it. Heroism is humility. In the acknowledgement of imperfection heroes become more human. You can identify with them. My dad is not perfect. But he never holds to the illusion of being so. I can’t remember an instance where he made a mistake or hurt someone and did not apologize afterwards. But humility is more than seeking forgiveness when you mess up. It’s about the way you see other people. You see them as being someone of worth and value. You see them as equals. My dad loves to talk to the clerks at the store, the waiters at the restaurant, and the attendants at the gas station. He does not see them as being any less of people because they serve him. He sees them as worthy in their own right. Humility is not a sign of weakness, but of strength. To be humble, you have to be confident in who you are. And then you serve from the depths of your power. See in others the same value that you see in yourself. Serve people through that lens. Heroes are leaders. They initiate. They give instruction and wisdom. They create things. But my dad shows me something else about leadership. True leadership is inspiring the generosity of others. It was a Sunday morning, and we were driving back from church. As we drive past one of the universities, where there had recently been a conference, we see the space is littered with plastic bags and other garbage. No one would ever clean it up. It wasn’t their responsibility. But my dad is not no one. He returns a few hours later with several garbage bags. And piece by piece, he picks up the litter, and puts it away. My mom and I work with him. I’m not entirely sure why I joined. Perhaps it was a feeling of obligation. Perhaps it was a feeling of guilt. But most likely, it came out of my father’s leadership. His generosity inspired my generosity. I was not the only one inspired. Several passersby joined in. For no reward or pay, they picked up garbage for a few hours on a Sunday afternoon. And when we finish, we share a few sodas and return home – the back of our Land Rover piled with garbage bags. See a need and act. Give those around you inspiration. Inspire them to generosity. Heroes do not neglect the simple things of life – those sweet and lighthearted joys. They do not forget to play. There is no purpose to the game, but in that space of play we find purpose. Play is enough for its own sake. It does not need a reason. And because the play has no reason, because its own life fills it, it creates a space for connection. You bond with those you play with. If you can trust them fully in something as small as a game, you can trust them with more. Take some time to laugh. Play with those you love. At the heart of any hero is the care for others. They are philanthropists in the true sense of the word – love of humanity. My parents have been in Kenya for over 20 years. Besides the greater understanding of the culture, they build relationships. Those connections have the trust that constant love brings. From that trust, they are able to serve. They touch people in a way that few others can. My dad mentors teachers and leaders in the community. He knows their needs and can communicate in a way that speaks to them. And they respect him. He has proven himself over and over again. Building that kind of trust takes time and effort. But it’s worthwhile. Such footprints of love will last forever. But love for the community he serves is not the only type of love my father shows. He loves his family. Whenever we are home for vacations, he keeps his schedule as free as possible. When we are at school, he comes regularly to visit us. And in those times that he speaks about his love, the thousand actions that go before the words testify to truth. The depth of his love is shown in another game we play – the origins of which are uncertain. It is a competition to say the words “la, la, la…” more times than the other person. We sneak them into emails, notes, and phone messages. On the surface, the game appears ridiculous. But as I grow older, I come to understand it differently. What each “la” is really saying is “I love you.” We compete to outdo each other in love. And that is what it means to be hero. Be love to those around you. Seek to outlove everyone. What heroes do you follow after? What footprints do they leave? Final impression. I made this photo near Cape Town, South Africa. PS: A most blessed birthday to my dad (his birthday was this past Saturday). What an awesome tribute to your dad. Well done and I know it comes from the heart. Thanks Judy. It was a fun post to write. My dad is much deserving of tribute. This is my favorite post of yours, Joshua. I am off to meditate now on who my heroes are…and what can I learn from them. My mother, my grandfather. Thank you for helping me think about them in this deeper way. I’m glad you enjoyed it. I’d love to hear more about your heroes sometime. Amazing definition of leadership! The world would be a better place if there were more people like your father. An immeasurable, powerful gift of love, exercised in Leadership. Q, That’s part of my hope in writing about him. The more that follow his example, the better. Bron, I appreciate your kind words. They apply to what my dad has given me. What about you? Who are some of your heroes? You reming me of your dad who tells me to have a rest and reflect on my creator instead of having work on creation 24/7. Your mum also a great mentor in word and deed. Humility is the most importand platform and pulpit of preaching all good gospels.